Nancy Patricia D’Alesandro Pelosi, born March 26, 1940, is an American politician serving as the Minority Leader of the United States House of Representatives since 2011, representing California’s 12th congressional district. She previously served as the 52nd Speaker of the House from 2007 to 2011, the only woman to do so. Her ascent to House Speaker also made her the highest-ranking female politician in the history of the United States. She is the odds-on favorite to replace outgoing speaker Paul Ryan. A member of the Democratic Party, Pelosi represents California’s 12th congressional district which consists of four-fifths of the city and county of San Francisco. She served as the House Minority Whip from 2002 to 2003, and was House Minority Leader from 2003 to 2007, holding the post during the 108th and 109th Congresses under George W. Bush. After the Democrats took control of the House in 2007 and increased their majority in 2009, Pelosi was elected Speaker of the House. After the Democrats lost House control in the 2010 elections, Pelosi was elected as the Democratic Leader by House Democrats and therefore the Minority Leader in the Republican-controlled House from. During and after her tenure as Speaker, Pelosi was perceived as a contentious political figure, with Republican candidates frequently trying to tie their Democratic opponents to Pelosi and with moderate Democrats seeking to show their moderate bona fides by expressing opposition to Pelosi. Pelosi is expected to run for Speaker of the House of Representatives on the opening of the 116th U.S. Congress on January 3, 2019. If reelected Speaker, Pelosi would become the seventh individual to return to the Speakership on non-consecutive terms of office and the first since Sam Rayburn in 1955. Speaker Pelosi was mired in a host of scandals during her years in the House. It is fair to say, however, that Pelosi and other Democrats are not on an island which contains ALL Congressional and other D.C. scandals. But Pelosi’s illustrate really well the apparent “in-your-face” attitude from many lawmakers on the left. While the Obamacare incident was really bad, it is just one of many under the watch of Pelosi. Pelosi’s husband, Paul Pelosi, had invested just in time. He bought between $100,000 and $250,000 in SunEdison stock on Oct. 24, 2014, according to congressional financial disclosures. The company announced its First Wind acquisition on Nov. 17, just 3 weeks after Paul Pelosi’s stock purchase. Coincidence? A report from the Washington Free Beacon revealed that Pelosi is alleged to have enriched herself and her husband, Paul, through her efforts to “steer taxpayer funds” to a San Francisco-area light rail project. Pelosi’s support for the project caused local real estate prices to escalate such that a large parcel of land owned by “high-dollar Democratic donor” Marc Benioff’s company received a huge profit upon selling it to the Golden State Warriors of the NBA. Pelosi’s husband is also a significant investor in the company. Pelosi pushed for taxpayer subsidies for the rail project for over ten years, and that project did much to boost the real estate market in the area, according to commercial real estate experts. The report says that “liberal billionaire hedge fund manager” Tom Steyer — best-known for funding millions of dollars for national television ads promoting the impeachment of President Trump — may also have been further enriched through Pelosi’s efforts to provide federal subsidies to the project. Let’s see: Tom Steyer, who is a billionaire Democrat activist who hates Donald Trump, Nancy Pelosi, former House Speaker who wants her job back, and a financial windfall for both through the use of taxpayer subsidies. Sound familiar? Overall, according to documents uncovered in January 2011, Pelosi used US Air Force corporate aircraft for a total of 43 private trips, covering 90,155 miles, from January 1 through October 1, 2010. Previous documents show the former Speaker’s military travel cost the USAF $2,100,744.59 over one two-year period — $101,429.14 of which was for in-flight expenses, including food and alcohol. Purchases for one Pelosi-led congressional delegation traveling from Washington, D.C., through Tel Aviv, Israel to Baghdad, Iraq May 15-20, 2008 included: Johnny Walker Red scotch, Grey Goose vodka, E&J brandy, Bailey’s Irish Crème, Maker’s Mark whiskey, Courvoisier cognac, Bacardi Light rum, Jim Beam whiskey, Beefeater gin, Dewars scotch, Bombay Sapphire gin, Jack Daniels whiskey, Corona beer and several bottles of wine. In investigations into Pelosi’s rampant use of military planes at taxpayer expense, documents further detail former Speaker Pelosi’s abuse of military aircraft when House Speaker. She provided sweetheart travel deals for her adult children. But it did not stop there. Members of the House are able to obtain permission from the Office of the Speaker for the use of military luxury and military-supported travel for congressional delegation trips. These trips, known as CODELs, exploded in number and cost under House Speaker Pelosi. As a footnote here: 1) Pelosi complained to the Air Force that the jet first offered for her trips back-and-forth from D.C. to San Francisco was not sufficient for her needs. How so? It had to refuel during each trip. She demanded a replacement jet that could fly non-stop from Washington to the Bay Area. When her demands were made public, there was a huge outcry, especially in light of her abuse of taxpayer funds for her private jet flights. So what have former and current House Speakers have and do about their air travel? Former Speaker John Boehner flew commercially. Current House Speaker Paul Ryan flies commercial between his home and D.C., skipping private jet usage. Incidentally, Air Force private jet flight for House Speakers IS allowed, but neither Boehner nor Ryan uses it. There is nothing wrong with finding good investment opportunities or investing successfully in startup companies or even in real estate trading. That’s not what Pelosi and her husband did to get wealthy. The Pelosi family made most of their wealth through Insider trading. She is privy to information she wouldn’t otherwise have if not for her position in Congress, and she uses this so that her husband can create active trades which have made millions of dollars. In the meantime, Pelosi leads the throng of Democrats who clamor for Trump to release his tax records. So, why doesn’t Pelosi give over her financial and tax records? Why doesn’t every Democrat who has a problem with Trump’s taxes bring out their own documents in a show of solidarity? After all, they’re more than content to spread Trump’s business every which way. People seem to forget that during the 2012 Presidential campaign, Pelosi and other members of Congress refused to release their tax returns and that was brought to light. Facing questions about why she and other top Congressional officials won’t release their tax returns, Pelosi downplayed her previous demands for presumptive GOP presidential nominee Mitt Romney to release his, calling the issue a distraction. Pelosi had strongly urged Romney to provide further disclosure of his tax returns. But while maintaining Romney should release more documents because of “custom” and “tradition,” Pelosi when facing media demands for HER tax returns said the issue “was trivial compared with economic issues.” She responded, “We spent too much time on that. 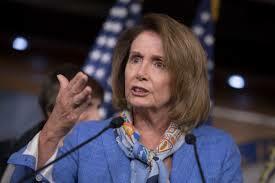 We should be talking about middle-income tax cuts,” Pelosi said after answering two questions about the issue. The Minority Leader faced questions about the issue after a McClatchy News report showed only 17 of 535 Members released their tax returns when asked. Bringing back memories of these Pelosi scandals and the unethical if not illegal abuse of her position in Congress for personal enrichment for herself, her husband, and friends and campaign contributors simply leave a bad taste in the mouths of American citizens. Is it any wonder that the approval ratings for members of Congress hover close to single digits. And yet they still are re-elected again and again and go on taking advantage of political might and power at every opportunity. Why does its allowance continue? It’s simple: Washington D.C. is so far removed from the sight and minds of most Americans, unless a scandal that negatively impacts Americans personally occurs, politicians are most often given a free pass. Shame on us! How can any of this be rectified if WE don’t do it? It is foolish to expect that someone who is allowed to cheat the system again and again with no accountability would stop cheating! Congressional actions by many that have been exposed prove that point. What is horrifying is to think that even with the multiple scandals we discover, how many remain unknown to us? Honestly, we’d probably all gasp if we knew. We must stop burying our heads in the sand. Americans must begin to hold our elected officials accountable for all the improprieties they are guilty of and for all the financial waste of taxpayer dollars that are included. How? Will any of this happen? CAN any of this happen? The answer to both is “Probably Not.” Why? Congress has the power to write or not-write legislation, personally follow Congressional guidelines, and hold or refuse to hold themselves and fellow members accountable. It’s too easy for them to just push the ball down the road not making any waves. “Quid pro quo” is pretty much the everyday occurrence. Term Limits would stop that ball from rolling, but Congress would have to pass Term Limit laws. Do you think that will happen? It’s doubtful. After all: Congress gets to decide how much they make personally, how much they can each receive in personal benefits, and the budgets for their offices, including staff payroll. AND THEY JUST TELL US HOW MUCH WE NEED TO SEND TO THEM TO PAY FOR THESE! Don’t forget: they’re not like you and me. When our checking accounts get emptied, we must wait until the next paycheck. If you’re a member of Congress and the “candy store” — the Treasury — gets empty, they just raise the debt limit and borrow some more money! You and I get to pay the bills AND PAY THE INTEREST ON THE MONEY THEY BORROW. Sounds like a pretty good deal……for them! This makes me sick to my stomach. I will never understand how anyone thinks any of these swamp creatures are good for We the People.